In many bacteria, the signal molecule AI-2 is generated from its precursor S-ribosyl-L-homocysteine in a reaction catalysed by the enzyme LuxS. However, generation of AI-2-like activity has also been reported for organisms lacking the luxS gene and the existence of alternative pathways for AI-2 formation in Escherichia coli has recently been predicted by stochastic modelling. Here, we investigate the possibility that spontaneous conversion of ribulose-5-phosphate could be responsible for AI-2 generation in the absence of luxS. Buffered solutions of ribulose-5-phosphate, but not ribose-5-phosphate, were found to contain high levels of AI-2 activity following incubation at concentrations similar to those reported in vivo. To test whether this process contributes to AI-2 formation by bacterial cells in vivo, an improved Vibrio harveyi bioassay was used. In agreement with previous studies, culture supernatants of E. coli and Staphylococcus aureus luxS mutants were found not to contain detectable levels of AI-2 activity. However, low activities were detected in an E. coli pgi-eda-edd-luxS mutant, a strain which degrades glucose entirely via the oxidative pentose phosphate pathway, with ribulose-5-phosphate as an obligatory intermediate. Our results suggest that LuxS-independent formation of AI-2, via spontaneous conversion of ribulose-5-phosphate, may indeed occur in vivo. It does not contribute to AI-2 formation in wildtype E. coli and S. aureus under the conditions tested, but may be responsible for the AI-2-like activities reported for other organisms lacking the luxS gene. In the marine bacterium Vibrio harveyi, autoinducer 2 (AI-2) is one of three quorum-sensing molecules regulating the production of bioluminescence in a population-density-dependent fashion [1, 2]. In recent years, numerous pathogenic and non-pathogenic bacteria have also been shown to produce AI-2 (for a recent review see ), and for this reason the molecule has been suggested to function in interspecies communication [1, 4–7]. AI-2 is the collective term for a group of signal molecules formed from a common precursor, 4,5-dihydroxy-2,3-pentanedione (DPD). DPD is generated by many bacteria as a by-product of the activated methyl cycle in a reaction catalysed by LuxS [4, 8]. LuxS acts by cleaving S-ribosylhomocysteine (SRH) to yield homocysteine and the reactive DPD, which spontaneously cyclises to from a range of furanone derivatives (Fig. 1). Two of these, (2S,4S)-2-methyl-2,3,3,4-tetrahydroxytetrahydrofuran-borate (S-THMF-borate) and (2R,4S)-2-methyl-2,3,3,4-tetrahydroxytetrahydrofuran (R-THMF), are recognised by specific periplasmic binding proteins in V. harveyi and Salmonella enterica Serovar Typhimurium, respectively [9, 10]. 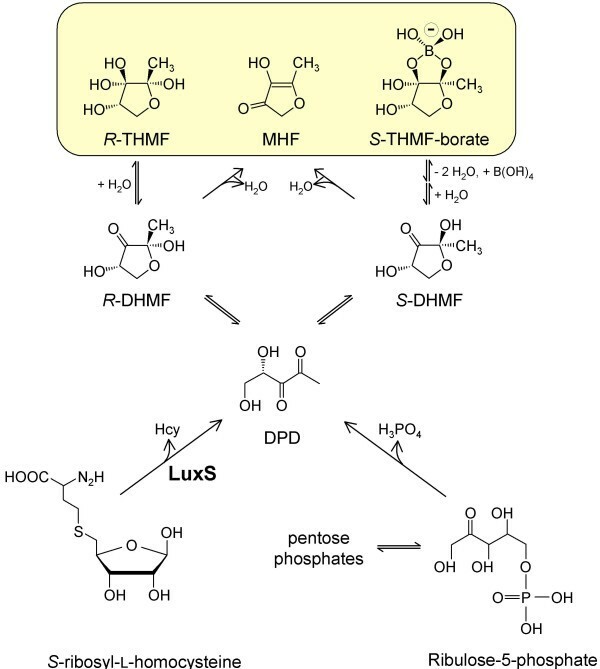 Another derivative, 4-hydroxy-5-methyl-3(2H)-furanone (MHF), has also been confirmed as a product of the LuxS catalysed reaction in vitro  and shown to have moderate bioluminescence inducing ability in V. harveyi [4, 8]. Pathways of DPD and AI-2 formation. The schematic integrates pathways described for production of 4,5-dihydroxy-2,3-pentanedione (DPD) from D-ribulose-5-phosphate  and S-ribosylhomocysteine (SRH)  with the subsequent formation of AI-2 molecules (yellow box) detected by V. harveyi and S. enterica serovar Typhimurium . Ribulose-5-phosphate is formed enzymatically from other sugar phosphates and its reactive open-chain carbonyl form in aqueous solution facilitates DPD generation. DPD cyclisation leads to several products forming via 2,4-dihydroxy-2-methylhydrofuran-3-one intermediates, including two distinct autoinducer molecules, S-THMF-borate ((2S,4S)-2-methyl-2,3,3,4-tetrahydroxytetrahydrofuran-borate; detected by V. harveyi) and R-THMF ((2R,4S)-2-methyl-2,3,3,4-tetrahydroxytetrahydrofuran; detected by S. enterica serovar Typhimurium) as well as MHF (4-hydroxy-5-methyl-3(2H)-furanone). Intermediates or side products shown are: S-THMF, (2S,4S)-2-methyl-2,3,3,4-tetrahydroxytetrahydrofuran; R-DHMF, (2R,4S)-2,4-dihydroxy-2-methyldihydrofuran-3-one; S-DHMF: (2S,4S)-2,4-dihydroxy-2-methyldihydrofuran-3-one; Hcy, homocysteine. Interestingly, formation of MHF from D-ribulose-5-phosphate (Rul-5-P) has also been reported. This phenomenon was initially witnessed following the action of spinach phosphoriboisomerase on ribose-5-phosphate (Rib-5-P) but was dismissed as an anomalous side-activity of the enzyme . The authors demonstrated a transient accumulation of an unknown intermediate, formed from the sugar phosphate, which subsequently converted to MHF. Later, Hauck et al. demonstrated that MHF arose spontaneously from Rul-5-P, and identified the unknown intermediate as DPD [12, 13]. Thus, spontaneous conversion of Rul-5-P may provide a novel route by which AI-2 could form in a luxS-independent fashion. However, whilst it is known that Rul-5-P gives rise to DPD under certain conditions in vitro, and that chemically synthesised DPD can stimulate bioluminescence in V. harveyi AI-2-responsive reporter strains [14–16] the principle of LuxS-independent formation of AI-2 activity from Rul-5-P in biologically relevant quantities has yet to be proved. Furthermore, the possibility and the ramifications of this process occurring in vivo have not been previously addressed. Here we demonstrate that spontaneous conversion of Rul-5-P does indeed give rise to potent AI-2 activity and investigate various luxS mutants, including an E. coli strain affected in central carbon metabolism, for LuxS-independent AI-2 formation in vivo. In addition, consideration is given to the possible implications of this alternative mechanism for AI-2 production. A solution of 5 mM Rul-5-P was incubated at 37°C for 24 h, based on the methods previously described for MHF formation [12, 13], and assayed for bioluminescence-inducing activity in V. harveyi BB170, a bioreporter for detection of AI-2 activity . Addition of this solution to the reporter strain induced high levels of bioluminescence, much higher than those observed for a positive control of 5 mM MHF. By comparison, the isomers Rib-5-P and xylulose-5-phosphate (Xyl-5-P) stimulated little or no bioluminescence (Fig. 2A). Since bioluminescence in V. harveyi is also controlled by the signal molecule N-3-hydroxybutanoyl-L-homoserine lactone (AI-1), each compound was also tested with the AI-1 responsive bioreporter, V. harveyi BB886 . No bioluminescence was induced in this strain (Fig. 2A) indicating Rul-5-P-mediated bioluminescence to be induced specifically via the AI-2 detection system. Spontaneous generation of AI-2 activity in ribulose-5-phosphate solutions. (A) AI-2 activity in pentose phosphate solutions. Reaction buffer (10 mM sodium phosphate, pH 7.7) was incubated alone (control) or containing either 5 mM MHF, 5 mM ribose-5-phosphate (Rib-5-P), 5 mM xylulose-5-phosphate (Xyl-5-P), or 5 mM ribulose-5-phosphate (Rul-5-P). After incubation for 24 h at 37°C, the solutions were analysed for the presence of bioluminescence-inducing activity using the V. harveyi BB170 and BB886 bioassays. V. harveyi BB170 (white bars) is specifically activated by AI-2 and BB886 (grey bars) by AI-1. (B) AI-2 activity in 5 mM ribose-5-phosphate solutions incubated with phosphoriboisomerase (10 U/ml). Samples were taken immediately after the start of the experiment (white bars, 0 h) or after 2 h incubation at 37°C (grey bars). Controls contained reaction buffer only (buffer), no enzyme (buffer + Rib-5-P), no substrate (buffer + enzyme), or heat-inactivated enzyme (buffer + Rib-5-P + enzyme (inactive)). (C) Kinetics of AI-2 formation in Rul-5-P solutions. 0.5 mM Rul-5-P in reaction buffer was incubated at 37°C and samples removed and snap-frozen in liquid nitrogen at the times indicated. The samples were then analysed for AI-2 activity using V. harveyi BB170. Results represent the mean (± SD) of three independent experiments. AI-2 activity is determined by the fold-induction of light emission relative to that of the negative reaction buffer control. For comparison, approximately 400-fold induction was observed with E. coli MG1655 culture supernatants. To demonstrate that the observed AI-2 activity was not caused by impurities present in the commercial preparations, Rul-5-P was also produced enzymatically. Incubation of 5 mM ribose-5-phosphate in the presence of active spinach phosphoribose isomerase (10 U/ml), which isomerised the substrate to Rul-5-P, resulted in the formation of high AI-2 activity, whereas no significant activity was observed after incubation with heat-inactivated enzyme (Fig. 2B). Furthermore, time course experiments performed with freshly prepared 0.5 mM Rul-5-P incubated at 37°C showed that AI-2 activity gradually increased over time, typically displaying a maximum after 5 hours (Fig. 2C). This was consistent with a conversion of Rul-5-P firstly to DPD, and then to the less-active MHF, in agreement with previously observed spectrophotometric data [11, 13]. Fig. 2C shows that approximately 20-fold induction of bioluminescence was observed for the sample removed at the beginning of the time course experiment (0 h). This activity most likely originated from Rul-5-P conversion during the several hours of incubation in the V. harveyi BB170 bioassay rather than an intrinsic activity of the compound itself. The concentration range of Rul-5-P used in these experiments was chosen because it matches the intracellular concentrations reported for some organisms in the literature, such as yeast (approximately 0.5 mM; ). However, much lower values in the range of 1–10 μM can be estimated from metabolite determinations in animal and human tissues, including liver, brain, blood samples [19–22]. Rul-5-P has been previously reported to give rise to MHF with approximately 1.3% of the sugar-phosphate converting to the furanone after incubation at pH 7.5 and 35°C for 15 h . Liquid chromatography/tandem mass spectrometry (LC-MS/MS) confirmed that MHF was also formed under the conditions used in this study (data not shown), with conversion rates below 1% after 24 h of incubation at pH 7.7 and 37°C. Taking into account the low conversion rates, much higher AI-2 activities were observed in Rul-5-P solutions than could be expected solely due to formation of MHF (Fig. 2A and data not shown). This demonstrates that another compound derived from Rul-5-P, but different from MHF, was responsible for the observed activities. Since DPD is known to be generated in Rul-5-P solutions  and was also identified after o-phenylenediamine derivatisation under the incubation conditions used in this study (data not shown), this was most likely S-THMF-borate (see Fig. 1), a DPD-derivative known to activate the BB170 bioreporter . To determine whether LuxS-independent production of AI-2 also occurs in vivo, E. coli DH5α (which contains a frameshift mutation in luxS) and Staphylococcus aureus Newman luxS were each cultured in LB medium in the presence of 0.5% glucose. In E. coli, glucose at this concentration had previously been shown to prevent AI-2 uptake via catabolite repression . In each case, cell-free culture supernatants from mid- to late exponential phase onwards appeared to display 3–6 fold greater induction of bioluminescence in V. harveyi BB170 than controls of sterile control medium (not shown). However, following careful scrutiny it became apparent that this induction was not caused by true AI-2 activity. Metabolism of glucose led to acidification of the culture environment, most prominently between 3–5 hours of growth, during which time pH values typically declined from pH 7 to pH 5. Addition of culture-supernatants from this period onwards, to the V. harveyi BB170 bioassay, led to a subsequent decrease in pH of the bioassay medium (not shown). This coincided with enhanced recovery of endogenously-induced bioluminescence in V. harveyi BB170, following dilution into the assay medium (Fig. 3A). Acidification has been previously reported by DeKeersmaecker and Vanderleyden  to impact on the AI-2 bioassay, therefore, the assay medium was modified to include a final concentration of 25 mM HEPES buffer to increase the total buffer strength. This prevented the more acidic culture-fluids from influencing the pH of the assay medium and simultaneously eliminated the induction of bioluminescence observed for the luxS mutant culture supernatants (Fig. 3B). Incorporation of HEPES did not affect the detection of true AI-2 activity in culture-fluid samples as shown by the unaffected response to positive control samples. Overall, the data demonstrated that culture-supernatants of the two luxS mutants grown in LB medium did not contain detectable AI-2 activity. E. coli MG1655 pgi-EDP luxS produces extracellular AI-2 activity. (A) Conventional V. harveyi BB170 bioassay  with E. coli DH5α culture supernatants obtained from cultures growing in LB + 0.5% (w/v) glucose. Turquoise, grey, pink, bright green, dark green, blue, and red lines indicate the bioluminescence observed for E. coli DH5α culture supernatants after 0, 1, 2, 3, 4, 5, and 6 h of growth, respectively. Open circles, negative control (LB medium + 0.5% glucose); closed circles, AI-2 containing positive control (E. coli MG1655 culture supernatant after 3 h of growth). (B) Modified V. harveyi BB170 bioassay with the same E. coli DH5α culture supernatants as analysed in (A). 25 mM HEPES was present in the bioassay medium to prevent acidification. For figure legends, see (A). (C) Growth (lines) and AI-2 activity profiles (bars) for E. coli MG1655 luxS (blue) and E. coli MG1655 pgi-EDP luxS (red). Each strain was grown in LB medium + 0.5% (w/v) glucose and samples removed hourly. For each sample the optical density at 600 nm was recorded and AI-2 activity in culture supernatants recorded using the modified V. harveyi BB170 bioassay containing 25 mM HEPES. Results represent the mean of three independent bioassays. For AI-2 activity, error bars represent the standard deviations. The experiments were repeated five times with similar results. AI-2 activity was not apparent in the culture-fluids of luxS mutants investigated above. However, in E. coli at least, just 25% of exogenously supplied glucose is believed to be catabolised via the oxidative pentose phosphate pathway (OPPP) to yield the intermediate Rul-5-P . It is therefore possible that LuxS-independent generation of AI-2 from Rul-5-P may be limited under the growth condition used in this study. It is also possible, that Rul-5-P concentrations are generally very low in E. coli and related organisms. In order to maximise the potential for detectable AI-2 production from the sugar-phosphate in vivo, an E. coli MG1655 pgi, edd, eda triple mutant (E. coli pgi-EDP; ) was utilised. In this strain, glucose catabolism occurs exclusively via the OPPP as entry of the sugar into the glycolytic and Entner-Doudoroff pathways are blocked (; pgi encodes phosphoglucose isomerase; edd and eda encode phosphogluconate dehydratase and 2-keto-3-deoxy-6-phosphogluconate aldolase, respectively). Production of LuxS-derived AI-2 activity by E. coli pgi-EDP was eliminated through the introduction of a luxS mutation. This was achieved by P1 bacteriophage transduction of the disrupted luxS gene from E. coli BL21 luxS  into E. coli pgi-EDP. The mutation was also introduced into the E. coli MG1655 parent strain. E. coli MG1655 luxS and pgi-EDP luxS were grown in LB containing 0.5% glucose. Cell-free culture-supernatants were harvested and tested for bioluminescence-inducing ability using the optimised (HEPES-containing) V. harveyi BB170 bioassay. E. coli pgi-EDP luxS culture-supernatants induced a response in V. harveyi BB170 that, whilst modest, was clearly not observed for E. coli MG1655 luxS (Fig. 3C). Typically a peak in bioluminescence-inducing activity was observed in E. coli pgi-EDP luxS culture-fluids following 5 hours of culture and displayed 4–6 fold greater bioluminescence induction than sterile LB alone. However, in the absence of glucose, AI-2 activity could not be detected (data not shown). Our finding that the DPD levels formed during the spontaneous conversion of Rul-5-P are sufficient to give rise to measurable AI-2 activity has several important implications. First, given the ubiquitous presence of Rul-5-P in metabolically active cells , it seems possible that molecules with AI-2 activity are intrinsically formed as by-products of pentose phosphate metabolism in all organisms and independently of the LuxS enzyme. Indeed, AI-2 activity has been reported in stationary phase culture-supernatants of Streptococcus pyogenes luxS mutants . Furthermore, some microorganisms, plants, and animals are known to produce MHF [29–33], a compound which, at least in the case of certain yeasts, is believed to be derived from Rul-5-P [12, 13]. Production of AI-2-like activity by higher organisms has also been demonstrated for algae of the genera Chlamydomonas and Chlorella  and evidence for the formation of DPD from Rul-5-P in tomato fruits has been provided . Thus, organisms other than bacteria may have developed the machinery necessary to either metabolise or exclude DPD-derived by-products such as AI-2. This may also explain the presence of lsr-type AI-2 uptake systems in bacteria that do not contain a luxS homologue . Sinorhizobium meliloti, for instance, possesses a complete putative lsr AI-2 uptake system and an AI-2 kinase (locus tags SMb21016-21022). Systems like this may have been acquired to minimise the loss of intrinsically produced DPD-derived compounds, or alternatively to scavenge the molecules released from other organisms present in the same niche, either bacteria or plants. Finally, given the relative ease with which DPD, and thus AI-2, appears to form from Rul-5-P, and the potential advantages currently believed to be gained by the utilisation of AI-2-dependent signalling, it would seem an interesting, but as yet unexplored, possibility that some organisms may have acquired enzymes to direct and enhance this process of AI-2 formation in a controlled fashion. In conclusion, we have demonstrated that spontaneous degradation of Rul-5-P gives rise to substantial amounts of AI-2 activity in vitro. However, our data suggest that whilst this route may also be operational in vivo, in E. coli its contribution to AI-2 production is negligible. It could, however, be responsible for the AI-2-like signals reported for some higher organisms or bacteria lacking luxS. Given the postulated importance of AI-2-based quorum sensing in many pathogenic bacteria, the generation of DPD via a LuxS-independent route may have important implications. E. coli DH 5α, E. coli BL21 luxS, E. coli MG1655 derivatives, and S. aureus Newman luxS  were routinely grown in Luria-Bertani (LB) broth or agar plates at 37°C. V. harveyi BB170 was grown in LB or AB medium . Where required, antibiotics were used at the following concentrations: 30 μg/ml chloramphenicol (for E. coli luxS mutants), 10 μg/ml tetracycline (S. aureus Newman), and 100 μg/ml kanamycin (V. harveyi BB170 and BB886). The V. harveyi BB170 bioassay was used for the detection of AI-2 activity in culture supernatants or in vitro reactions. Initially the procedure outlined by Bassler et al. was followed. For more careful analyses of luxS mutants, the assay was modified so that the AB medium employed contained 25 mM HEPES buffer, pH7.8, as additional component. AI-2 activity was defined as the fold increase in light production in comparison with medium or buffer controls. In vitro reactions were also tested using the AI-1 responsive reporter V. harveyi BB886 . The luxS deletion of E. coli Bl21 luxS  was transferred into E. coli MG1655 wildtype and an E. coli MG1655 pgi-edd-eda triple mutant (E. coli pgi-EDP,  by phage transduction using the bacteriophage P1 and a standard protocol . Successful transfer of the locus was established by PCR, using the primer pair LuxS-50-UF (CTCAGACTCGCCTGGGAAGAAAGAG) and LuxS-50-DR (GTGCGCACTAAGTACAACTAAGCC). Sugar phosphate solutions were prepared in 10 mM sodium phosphate buffer (pH 7.7) and, where indicated, were incubated at 37°C. Following the indicated incubation period each sample was frozen using dry ice and stored at -80°C. Rul-5-P and other sugar phosphates were obtained from Fluka/Riedel-de Haën and Sigma-Aldrich, respectively. Enzymatic synthesis of Rul-5-P was carried out by incubation of 5 mM ribose-5-phosphate with 10 U/ml spinach phosphoriboisomerase in 10 mM sodium phosphate buffer (pH 7.7). The reaction was incubated at 30°C for 2 h. Catalysis was stopped by chloroform extraction of the enzyme followed by freezing the samples on dry ice. For negative controls, spinach phosphoriboisomerase was inactivated by heat treatment (5 min at 85°C). DPD was detected after its derivatisation with o-phenylenediamine as described by Hauck et al. . Detection and quantification of MHF was achieved by high-performance liquid chromatography coupled to tandem mass spectrometry (HPLC-MS-MS) after chemical derivatisation of the compound as described by Husek . The work presented was funded by grants from the Welcome Trust and Biotechnology and Biological Sciences Research Council (Nigel Halliday) and a University of Nottingham studentship (Tim Tavender). We are grateful for the discussions and support provided by Prof Paul Williams and Dr Dave Barrett (both of Nottingham University). We would like to thank Prof. Uwe Sauer (ETH Zürich) for sending us the E. coli MG1655 pgi, edd, eda triple mutant, Prof Bonnie Bassler (Princeton University, USA) for providing the V. harveyi reporter strains and E. coli BL21 luxS, and Rebecca Pickard for her help in constructing luxS mutants. TJT performed the Rul-5-P in vitro experiments and AI-2 bioassays. He also generated the luxS mutants and performed the growth experiments. NMH carried out all chemical analyses, looking at DPD and MHF formation in both culture supernatants and in vitro reactions. KW conceived and designed this study and wrote the manuscript. KRH contributed to the design of this study and sections of the manuscript. All authors contributed to data analysis and interpretation.